It’s too hard…picking a name! Who would think that picking a name would be this difficult? Not me. I guess during the whole IVF process I kept picturing me with a girl and there are so many nice girl names, but I’m having a terrible time with a boy name. I have three possible leaders right now. I’m not going to share the names only because they still could change, BUT I will share the first letters. 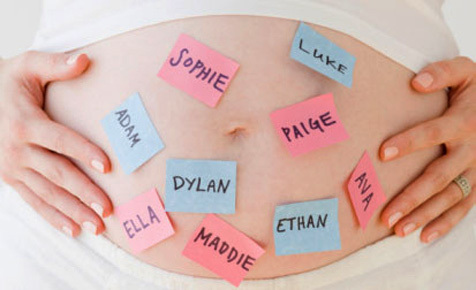 I envy those who know exactly what they would name their girl or boy. I thought this would be easier but so far it hasn’t been and I’ll probably end up with a top three list and once I meet him, whichever name he looks like will end up being his name. I tend to like unusual names. Nothing too out there like Apple or Sparrow but a name that you don’t hear every day. For example, I told my team at work that I won’t be picking Chris because I work with about six of them. Maybe, just maybe this baby name will be a surprise for when he’s born, but I’d love to start calling him by a name. Soon maybe. OMG…this was the hardest part for me too!! For the exact same reasons. I finally picked Elias b/c it was close to Elizabeth….which was my grandmother’s name…and Ryder, which was my other grandmother’s maiden name. I was named for both of my grandmothers and so was Eli. I didn’t know until after he was born what I was actually going to name him (Elias Ryder Michael or Ryder Elias michael…or Michael Ryder Elias, or ELias Michael Ryder…you get the idea) I finally got lazy and just picked what I initially felt. Then my friend accidentally called him Linus and I was like, “Linus….that’s a cute name! !” It was too late, haha! I also went on babycenter and did a survey for my top names. So they helped me pick, too! That’s a good idea, maybe I’ll do a poll and see which one people like the most. It may or may not help me but it’s worth a try. Commit or tell anyone until he was here. I posted a poll last week and it went ok. Some people were just nasty and instead of just voting, had to voice their opinions on those names. But it gave me some fun things to read. And it may have helped push me into a certain direction. That’s exactly how I felt. It’s weird when people tell you your name choice is stupid…who the hell cares? It’s not like it’s their kid! I had people tell Me that about Ryder but it’s my grandmothers maiden name so I wasn’t not going to use it. Grrrrr. Exactly! I mean the poll was meant to have people pick which one they like out of the three, not make a huge discussion about why they hate that name. Blah. People.